The armed wing of Hamas has admitted that a massive explosion in the Gaza Strip on Thursday was caused by militants preparing an armed operation. Hamas had initially blamed the explosion on an Israeli air strike and responded with rocket fire, but Israel denied any involvement. "Members of the Ezzedine al-Qassam Brigades were trying to prepare for a Jihad operation," the Hamas movement's armed wing said in a statement. The statement said six members of the brigades were killed in the blast, as well as the four-month-old baby of one of the militants. About 50 people were wounded, among them 15 children, Palestinian medics say. 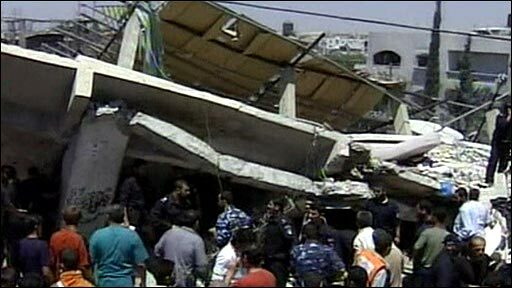 The blast destroyed a house and damaged about 10 neighbouring homes. On Thursday, Hamas militants fired dozens of rockets into Israel. A 59-year-old woman was seriously wounded in the barrage. In other violence on Thursday, an Israeli air strike on a refugee camp in Gaza killed three Hamas militants and four other militants were killed in various clashes.